Fishermen set their elver nets just below Bad Little Falls in the Machias River at Machias in March 2010 on the first day of elver season. Elvers, also called glass eels, are immature eels that come in from the sea to mature in fresh water. ELLSWORTH, Maine — It may have to go up quite a ways more before it compares to gold or saffron, but the price of elvers sure has come a long way in the past two years. According to officials with Maine’s Department of Marine Resources, the first day of the state’s 2012 elver fishing season on Thursday saw some fishermen getting as much as $2,200 per pound. Compare that with the 2010 elver fishing season, when the average price fishermen got for juvenile eels was $185 per pound. Between 1994 and 2010, the highest average price for their catch that elver fishermen received in any year was $346 per pound in 2007. Then last year, it jumped. Demand for the eels, which are shipped live to the Far East and then raised to adult size before being sold in seafood markets, reached unprecedented highs, causing the average price for the season to increase to nearly $900 per pound, according to DMR statistics. In some areas last year the price was reported to be more than $1,000 per pound. At noon Thursday, when Maine’s spring elver season officially opened, it went up again. According to some reports, one dealer in the Ellsworth area was offering $1,500 per pound on opening day. In the midcoast region, some were offering more than that. Sgt. Marlowe Sonksen of Maine Marine Patrol, DMR’s law enforcement division, said Friday that officers in the Knox and Waldo county region heard that at least one midcoast dealer was offering $2,200 per pound. “One [fisherman] told us that’s what he got,” Sonksen said. Elvers are juvenile eels that are born in the Sargasso Sea region of the Atlantic Ocean and then migrate to North American freshwater lakes and rivers. Elvers generally are caught at night in tidal rivers and streams by fishermen using funnel-shaped fyke nets or small, hand-dip nets mounted at the end of poles. During this elver season, fishing is allowed five days a week, from noon Sunday until noon Friday of each week. Elver fishermen have been known to catch several pounds in a single night. Since 2006, the number of elver licenses issued by the state has been limited to several hundred at most in order to protect the elver population. In 2011 and again this year, the number of licenses is capped at 407. According to DMR officials, the high price of elvers has generated a lot of interest and more illegal fishing by unlicensed fishermen. Before the season opened, there were people out trying to catch elvers without being noticed by marine patrol officers, they said. 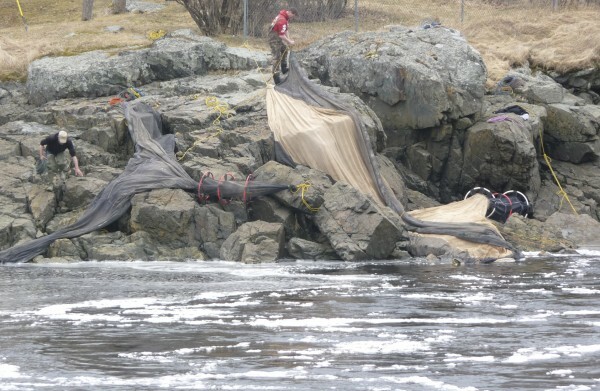 “A lot of our violations now are unlicensed people” using hand-dip nets, Sonksen said. Fyke nets, which Sonksen said are bigger and tend to catch “a lot more” elvers than hand-dip nets, have to be tagged with the name of their licensed owners and so generally aren’t used by unlicensed fishermen. Sonksen, who oversees officers operating along the midcoast between the St. George and Penobscot rivers, said that only one day into the season his officers already have written between eight and 10 citations total for illegal elver fishing. That estimate, he added, is higher than normal. Statewide, the number of summons written so far this elver season is around 20, he added. Lt. Dale Sprowl, who oversees marine patrol operations in the eastern half of the state, said Friday that officers also check on dealers to make sure they only buy elvers from licensed fishermen. He said Maine Marine Patrol makes unannounced spot checks on dealers and reviews their paperwork to make sure they are complying with the state’s regulations. “We already checked some dealers today,” Sprowl said. Some environmentalists have raised concerns that the population of the eels has been declining and say the eels should be protected by federal regulations. The U.S. Fish and Wildlife Service has been petitioned to list eels either as threatened or endangered, which would prevent them from being fished. According to Dr. Gail Wippelhauser of the Department of Marine Resources, no such designation is expected to be made before the end of the elver season on May 31.